Netherlands; 2Department of Radiology, Academic Medical Center, University of Amsterdam, Amsterdam, The Netherlands. lectual property Maria J. H. de Hair et al. All Copyright © 2013 are guarded by law and by SCIRP as a guardian. 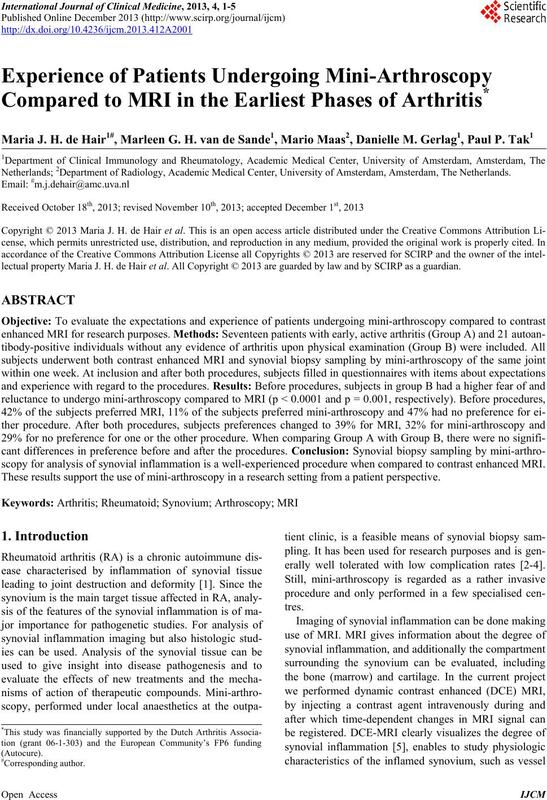 scopy for analysis of synovial inflammation is a well-experienced procedure when compared to contrast enhanced MRI. 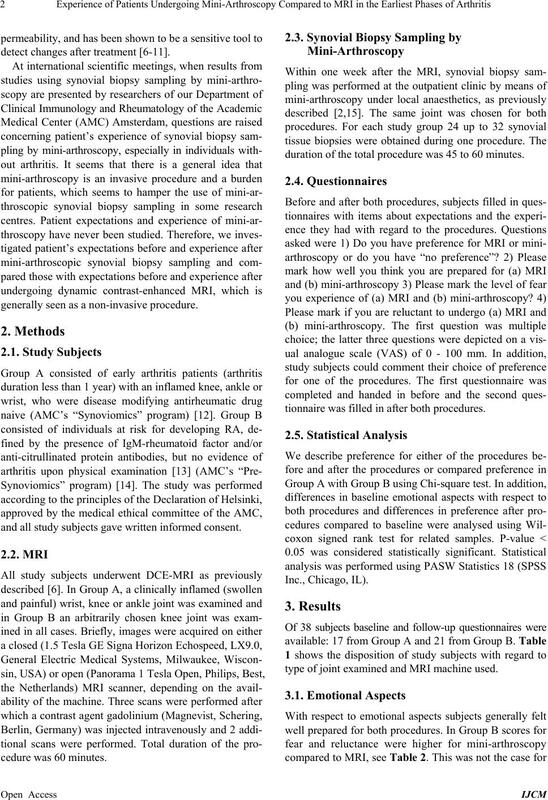 These results support the use of mini-arthroscopy in a research setting from a patient perspective. erally well tolerated with low complication rates [2-4]. detect changes after treatment [6-11]. generally seen as a non -invasive procedure. and all study subjects gave written in formed consent. duration of the t ota l proce du re was 45 to 60 minut es. tionnaire was filled in after both procedures. type of joint examined and MRI machine used. Table 1. Disposition of study subjects. body-posit ive individu als without arthritis at ri sk for developing RA. individuals w ithout arthritis at risk for developing RA. vidual emotional aspects (Table 3). cantly different from baseline preference (P = 0.602). cedures and before, p = 0.755). both procedures (P = 0.115). erated; no co mplicati o n s were reported. 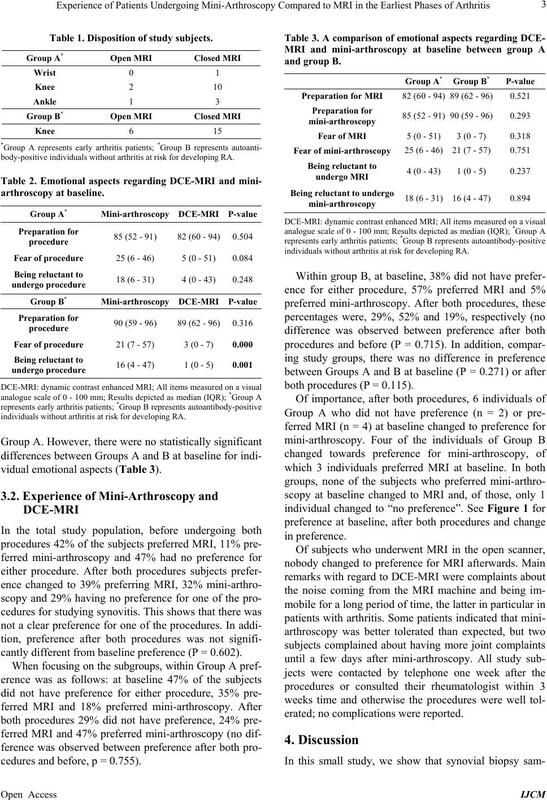 sults are depicted as perc entage within study Group A or B.
tients preferring mini-arthroscopy after both procedures. scopy in additional research centres. (Autocure ) for financia l sup po rt . tology (Oxford), Vol. 41, No. 2, 2002, pp. 210-215.
apy, Vol. 11, 2009, p. 256. 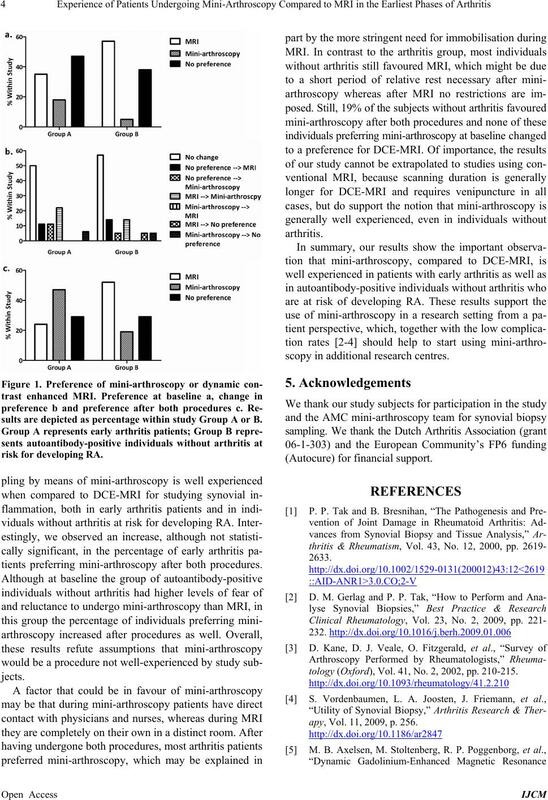 Journal of Rheumatology, Vol. 41, No. 2, 2012, pp. 89-94. Vol. 253, No. 1, 2009, pp. 234-240. Arthritis & Rheumatism, Vol. 50, 2004, pp. 1097-1106.
gica, Vol. 35, No. 3, 1994, pp. 275-281.
nance Imaging, Vol. 16, No. 7, 1998, pp. 743-754. 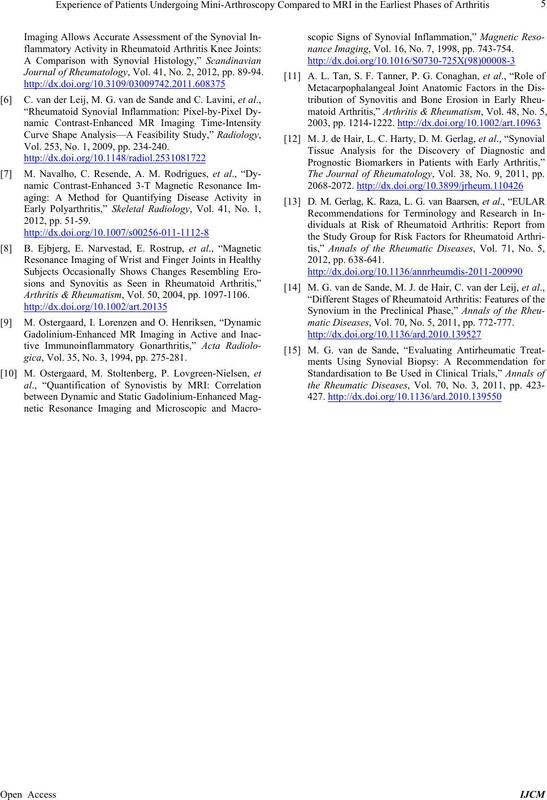 The Journal of Rheumatology, Vol. 38, No. 9, 2011, pp. matic Diseases, Vol. 70, No. 5, 2011, pp. 772-777.